Indianapolis is famous as an international destination for sporting events and conventions. As a result, people travel thousands of miles to spend time in the crossroads city. 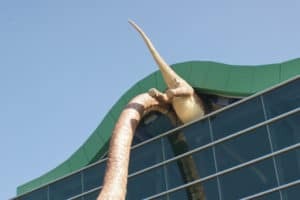 It should be no surprise that the Children’s Museum of Indianapolis follows along with the city’s spirit and offers a unique set of exhibits on top of the usual interactive science stations. If you’re not sure what that means exactly, read on. Every year when the weather is agreeable, the Children’s Museum of Indianapolis opens up a variety of outdoor sports-based exhibits that are just as interactive as the ones inside. Kids can play golf, hockey, basketball, baseball, football, and soccer. Of course, racing is on the menu too since this is the home of the Indianapolis 500. Kids can also climb up into an artificial tree and take a look around at all the fields. They can walk down the Avenue of Champions to see some of the greatest names any American sport has ever produced. Popular culture is a strange and constantly changing thing, but sometimes something sticks and becomes a part of the background culture of America. That’s the idea behind American POP, an exhibit all about the crazes and the trends that either ended as quickly as they began or stuck around until this day. At the exhibit, you can play a game of guessing whether a famous song was a cover or an original. You can see classic TV plots complete with old sets and a whole section on comics and comic book heroes. While other science museums have IMAX theaters, not many perform live plays. However, that’s just what happens at Lilly Theater, a place where live actors adapt some unusual stories for the stage and perform plays suitable for all ages. Like a regular theater, the Lilly Theater puts on new plays all the time, so you’ll have to check their schedule to see what they’re doing next. Tickets to see the performance are free with admission to the museum, but there’s a limited number of tickets per day. So, show up early to make sure you get one. Ever since astronauts first started going into space, they’ve captured the imagination of kids across the planet. This exhibit taps into this idea by taking visitors on a journey through the space program. It starts with the first manned American flights with the Mercury program and continues through Apollo to the International Space Station that orbits the planet even today. The exhibit includes astronaut artifacts along with recreations of the space station that demonstrate how people live in microgravity. The exhibit ends with the Schaefer Planetarium and the Liberty Bell 7, the space capsule used in America’s second manned space flight. There’s a lot to take in at the Children’s Museum of Indianapolis, and the place is so packed with exhibits that they spill out into the lot next door. If you’re in Indianapolis with your family and have a spare day, you can spend it all at the Children’s Museum.